The beauty of Beauty is its seamless set-in sleeve construction. 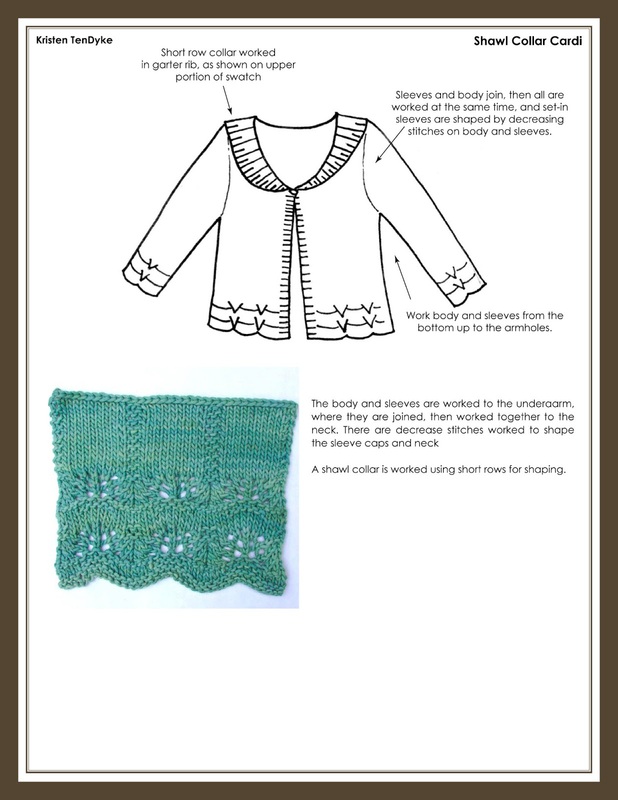 The body and sleeves, which are worked separately to the armholes, begin with a bit of lace followed by broken ribs. The yoke is shaped with decreases worked on the body to draw in the armholes, then the sleeve stitches are decreased to shape the caps. A few short-rows are worked to finish the caps and shape the neck, then the shoulders are joined with a three-needle bind-off. I originally designed Beauty to be knit using a hand-dyed yarn from a company that did not include dye-lot numbers on their yarns. This sweater is how I learned the lesson to ALWAYS alternate skeins of hand-dyed yarns when using more than skein. How did I learn this, you ask? Well… I didn't alternate skeins, and it resulted in a really obvious dye-lot change, right across the chest. I had a reason why I didn't do it—because when alternating skeins of yarn every other row the unused skein of yarn floats along the point where the skeins are switched. Usually this is at the end of a row. Because this sweater has the button band worked at the same time as the sweater the edge of the row will not be hidden by picked up stitches, and I didn't want the floats to be visible. Now, if you love the idea of knitting this in a hand-dyed yarn, don't fret… since I've knit this, I figured out that the yarn can be switched anywhere, and doesn't have to be at the edge of the row. Therefore, I'd suggest switching your yarn between the button band and the body stitches to make it less visible. To do this, be sure to twist the yarns together as you would when working intarsia to prevent any gaps from forming. Or, of course it's also really elegant in a solid-colored yarn, like the one I used in the sample that was photographed for the book. This is a relatively simple design, with a touch of elegance at the lower edge and cuffs. 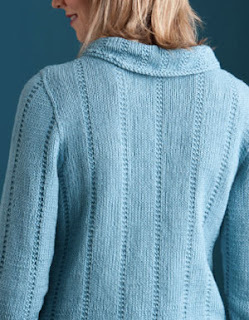 The garter stitch ribbing worked throughout the body helps tie the body together with the edging, and gives the sweater a bit of visual interest. 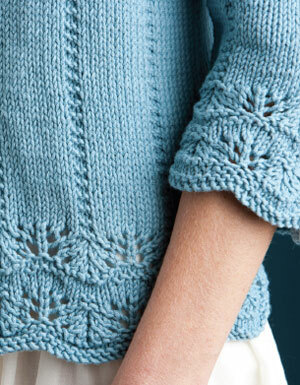 The most fun part about knitting this sweater, in my opinion, is the seamless set-in sleeve and armhole shaping. 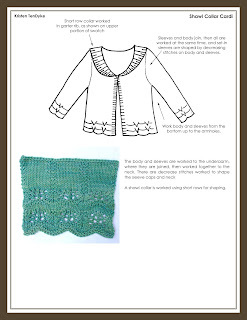 The body and sleeves are knit separately from the bottom up, then joined at the underarms like you would for a yoke or raglan sweater. But instead of working those familiar types of shaping, instead we begin by decreasing the body stitches, then the sleeve stitches, then working short rows to finish up the top of the sleeve cap and shoulders. It's really amazing to watch it knit up into a familiar seamed-sweater shape, but without picking up a tapestry needle. I just love it! If you've never tried it, I highly suggest giving this design a try. Or, the Trust Pullover… a different style sweater, made with the same sort of construction, AND a cool seamless pouch pocket.